Should We Eliminate the Extraordinary Measures? You’ve probably heard that Treasury will hit the debt limit on October 17 and soon thereafter it won’t be able to pay all of America’s bills. That second part is true: Congress needs to act soon—preferably before the 17th—so Treasury doesn’t miss any payments. But the first part isn’t: Treasury actually hit the debt limit way back on May 19. So how did Treasury keep paying our bills? Extraordinary measures. When money gets tight, Treasury uses several accounting gimmicks and cash flow sleights of hand—the extraordinary measures—for extra financing. The easiest to explain involves the G-Fund, which is offered to federal employees through their equivalent of a 401(k) plan. As its name implies, that fund invests in government bonds. But the Treasury Secretary has a special power: he can replace those bonds with IOUs. I kid you not. One day the G-Fund has Treasury bonds, and the next it has IOUs. Those IOUs don’t count against the debt limit, but they will eventually be repaid with interest once the debt limit gets increased. Employees don’t lose anything, and Treasury gets some extra financing room. Such budget gimmickry used to inspire outrage. In 1995, pundits accused Treasury Secretary Robert Rubin of violating his fiduciary duty and robbing federal employees when he did this. Today, the same action generates nary a peep; stuffing the G-fund with IOUs is standard operating protocol. So it is with the other extraordinary measures (for a full list, see here). Once extraordinary, they are now merely ordinary. No one takes the debt limit seriously until the extraordinary measures are running on fumes, as they are today. That’s what makes a new proposal from House Republicans intriguing. News reports indicate that they want to permanently eliminate some extraordinary measures as part of a debt limit deal. At first glance, you might worry that killing off those measures would undermine the financing buffer Treasury relies on in times of fiscal discord. But here’s the thing: Our leaders already take that buffer for granted. They know the gas gauge is flashing empty, but they don’t pull into the next station. Instead, they ask the fuel engineers at Treasury how much further we can make it. When the engineers say 30 miles, we drive another 29 ½. Eliminating the extraordinary measures wouldn’t change the unpleasant brinksmanship of the debt limit. It would merely shift the focus from the day extraordinary measures are exhausted to the day we first hit the debt limit. In return, it would increase the transparency of our goofy budget process and would rid us of the embarrassingly casual use of fiscal gimmicks. That’s a trade worth considering. But the gains must be balanced against some caveats. First, the extraordinary measures might be providing some fiscal buffer that remains unused, even now. For example, the Bipartisan Policy Center recently noted that an aggressive reading of the law might allow the Treasury Secretary to squeeze a bit more money out of one measure, known as the debt issuance suspension period. As BPC explains, that would be a dubious maneuver, but it would be better than default. So perhaps we could be giving up a bit of flexibility. Second, eliminating the extraordinary measures would reduce the time the next debt limit increase will last. Early this year, Congress raised the debt limit through May 18, but the extraordinary measures got us well into October. Without those measures, a similar increase now, perhaps to November 22, would come with no extra buffer. That’s a plus for transparency, but a minus if you want to avoid the debt limit as long as possible. Third, for the same reason, eliminating the extraordinary measures would make it easier for Congress to time when the debt limit comes to a head. That could be a plus or a minus depending on your view of congressional intentions. Finally, our political system might need several months of a blinking “empty” light to get people ready to act. My sense is that most people are now inured to the flashing and don’t even realize we hit the debt limit months ago. But maybe the flashing still serves some purpose. In short, the idea of eliminating the extraordinary measures is an interesting addition to the debt limit debate. Those measures provide much less flexibility than they used to. As with star ballplayers, there is some logic to retiring extraordinary measures once they’ve become merely ordinary. But the idea requires more tire-kicking to determine how any costs stack up against the benefits of a clearer, less gimmicky budget process. Since the day of Alexander Hamilton, the United States has never defaulted on the federal debt. Investors in T-bills maturing April 26, 1979 were told that the U.S. Treasury could not make its payments on maturing securities to individual investors. The Treasury was also late in redeeming T-bills which become due on May 3 and May 10, 1979. The Treasury blamed this delay on an unprecedented volume of participation by small investors, on failure of Congress to act in a timely fashion on the debt ceiling legislation in April, and on an unanticipated failure of word processing equipment used to prepare check schedules. The United States thus defaulted because Treasury’s back office was on the fritz in the wake of a debt limit showdown. This default was temporary. Treasury did pay these T-bills after a short delay. But it balked at paying additional interest to cover the period of delay. According to Zivney and Marcus, it required both legal arm twisting and new legislation before Treasury made all investors whole for that additional interest. The United States thus did default once. It was small. It was unintentional. But it was indeed a default. T-bill rates spiked upwards four times in the months around the default. In November 1978, Henry “Dr. Doom” Kaufman predicted that interest rates would rise. They did. Turn-of-the-year cash management disrupted rates as 1978 became 1979. And rates spiked and fell in October 1979 when Paul Volcker announced that the Fed would target monetary aggregates rather than interest rates (the “Saturday night special”). 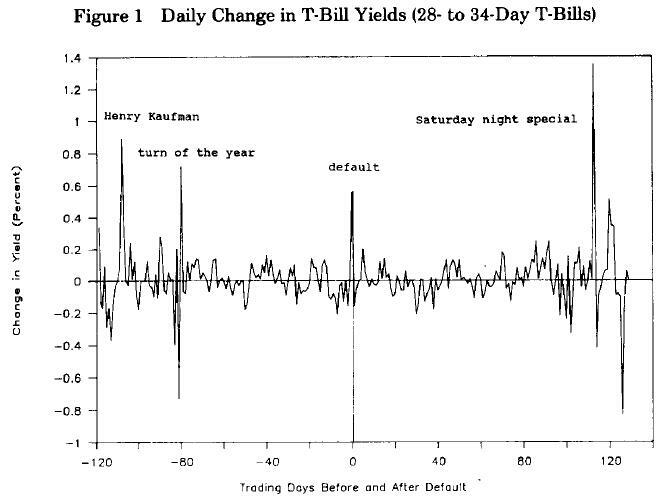 The fourth big move was the day of the first default, when T-bill rates rose almost 0.6 percentage points (i.e., 60 basis points).There’s no indication this increase reversed in the days that followed (the vertical line on the chart is just a marker for the day of default). Indeed, using more sophisticated means, including comparing T-bill rates to interest on commercial paper, the authors conclude that default led to a persistent increase in T-bill rates and, therefore, higher borrowing costs for the federal government. The financial world has changed dramatically in the intervening decades. T-bill rates hover near zero compared to the 9-10 percent range of the late 1970s; that means a temporary delay in payments would be less costly for creditors. Treasury’s IT systems are, one hopes, more reliable that 1970s vintage word processors. And one should take care not to make too much of a single data point. But it’s the only data point we have on a U.S. default. Not surprisingly it shows that even small, temporary default is a bad idea. Our leaders shouldn’t come close to risking it. P.S. Some observers believe the United States also defaulted in 1933 when it abrogated the gold clause. The United States made its payments on time in dollars, but eliminated the option to take payment in gold. For a quick overview of this and related issues, see this blog post by Catherine Rampell and the associated comments. P.P.S. This post originally appeared in May 2011. This version has been slightly edited. Today I had the chance to testify before the Joint Economic Committee about a perennial challenge, the looming debt limit. Here are my opening remarks. You can find my full testimony here. I’d like to make six points about the debt limit today. First, Congress must increase the debt limit. Failure to do so will result in severe economic harm. Treasury would have to delay billions, then tens of billions, then hundreds of billions of dollars of payments. Through no fault of their own, federal employees, contractors, program beneficiaries, and state and local governments would find themselves suddenly short of expected cash, creating a ripple effect through the economy. A prolonged delay would be a powerful “anti-stimulus” that could easily push our economy back into recession. In addition, there’s a risk that we might default on the federal debt. I expect that Treasury will do everything it can to make debt-service payments on time, but there is a risk that it won’t succeed. Indeed, we have precedent for this. In 1979, Treasury accidentally defaulted on a small sliver of debt in the wake of a debt limit showdown. That default was narrow in scope, but financial markets reacted badly, and interest rates spiked. If a debt limit impasse forced Treasury to default today, the results would be more severe. Interest rates would spike, credit would tighten, financial institutions would scramble for cash, and savers might desert money market funds. Anyone who remembers the financial crisis should shudder at the prospect of reliving such disruptions. Second, Treasury doesn’t have any “super-extraordinary” measures if the debt limit isn’t raised in time. Pundits have suggested that Treasury might sidestep the debt limit by invoking the 14th Amendment, minting extremely large platinum coins, or selling gold and other federal assets. But Administration officials have said that none of those strategies would actually work. Third, debt limit brinksmanship is costly, even if Congress raises the limit at the last minute. As we saw in 2011, brinksmanship increases interest rates and federal borrowing costs. The Bipartisan Policy Center—building on work by the Government Accountability Office—estimates that crisis will cost taxpayers almost $19 billion in extra interest costs. Brinksmanship also increases uncertainty, reduces confidence, and thus undermines the economy. In 2011, for example, consumer confidence and the stock market both plummeted, while measures of financial risk skyrocketed. Finally, brinksmanship weakens America’s global image. The United States is the only major nation whose leaders talk openly about self-inflicted default. At the risk of sounding like Vladimir Putin, such exceptionalism is not healthy. Fourth, as this Committee knows well, our economy remains fragile. Now is not the time to hit it with unnecessary shocks. Fifth, as the CBO confirmed yesterday, the long-run budget outlook remains challenging. Deficits have fallen sharply in the past few years. But current budget policies would still create an unsustainable trajectory of debt in coming decades. Congress should address that problem. But the near-term fiscal priorities are funding the government and increasing the debt limit. Finally, Congress should rethink the debt limit and the entire budget process. Borrowing decisions cannot be made in a vacuum, separate from other fiscal choices. America borrows today because this and previous Congresses chose to spend more than we take in, sometimes with good reason, sometimes not. If Congress is concerned about debt, it needs to act when it makes those spending and revenue decisions, not months or years later when financial obligations are already in place. When the dust settles on our immediate challenges, Congress should re-examine the entire budget process, seeking ways to make it more effective and less susceptible to dangerous, after-the-fact brinksmanship. It’s debt limit season again. Treasury will soon exhaust all the “extraordinary” (if familiar) measures it’s using to stay within the limit. By mid-October, Treasury will have just $50 billion on hand. Once that’s gone–maybe at Halloween, maybe a bit later–Uncle Sam won’t be able to pay all his bills or will be forced into doing something desperate like breaching the debt limit or minting platinum coins (kidding, mostly). We seen this movie before. Sometimes it ends with major policy changes, such as the 2011 deal that spawned the sequester. Other times it leads to minor tweaks, such as the January 2013 deal that linked congressional pay to passing separate budgets through the House and Senate. Eisenhower didn’t believe that spending cuts would be sufficient to keep federal debt under the cap. “Despite our joint vigorous efforts to reduce expenditures,” he told Congress, “it is inevitable that the public debt will undergo some further increase.” On July 30, Eisenhower asked Congress for an increase in the debt ceiling from $275 billion to $290 billion. The House of Representatives swallowed hard and approved Eisenhower’s request. But the Senate had other ideas. History, as they say, sometimes repeats. Swap the House and Senate and boost the dollar amounts and you’ve got rhetoric that could almost be plucked from today. Read Joe’s piece to find out how it all turned out. One tidbit (which I don’t think we should repeat): Treasury was forced to sell gold bullion to cover $500 million in debt.